See you next week!Posting may be light next week as we embark on another Bruggie Trek leaving Mum and Dad to mind the fort. 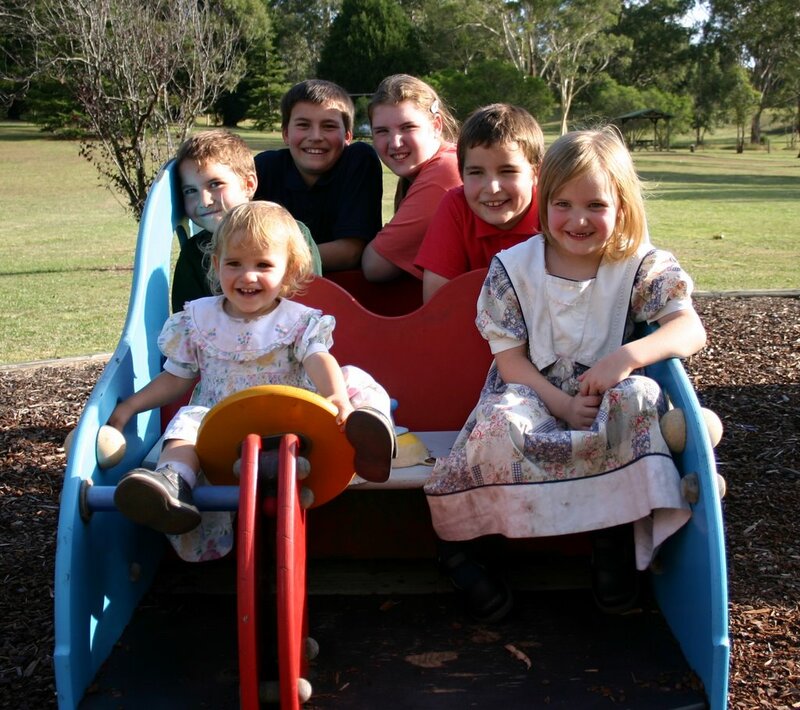 The purpose is to visit Marian Valley in Canungra Queensland so I can help the new Prior with the computer and accounting system. The secondary purpose (but more important according to the rest of the family) is a holiday! - and Play a lot (Recess). We also take lots of photos and get to record it for posterity here! So if you ever see a homeschooling family away from home, now you know they aren't avoiding school work, they're on a field trip. Last week I was away from home on business, visiting various clients and ending up in Melbourne before returning home. All told, I was away from Monday morning through to Sunday evening. When I returned home I was surrounded by all the children competing with each other to tell me everything they had done for the week. I was only able to blow a kiss to Lana standing at the rear. Although I already knew all the highlights from my regular calls to Lana, the children insisted I hear it directly rather than third hand. As I was trying to field six insistent voices and concentrate on all they were revealing, I thought, "Now I know how Mum and Dad feel when they visit!" This is a swarm of affection from those who love each other and understand that being a family means sharing experiences. Unconsciously the children know that for me to understand and love them I have to know what they did - or at least the highlights. One made this, another learnt a new trick, yet another had read an interesting tale or heard a story they wanted to share. The whole family was able to participate in this onslaught as each was able to add their knowledge of the event with their view or participation. Although I find my times away quiet (too quiet!) I really enjoy the arrival at home. Quick! 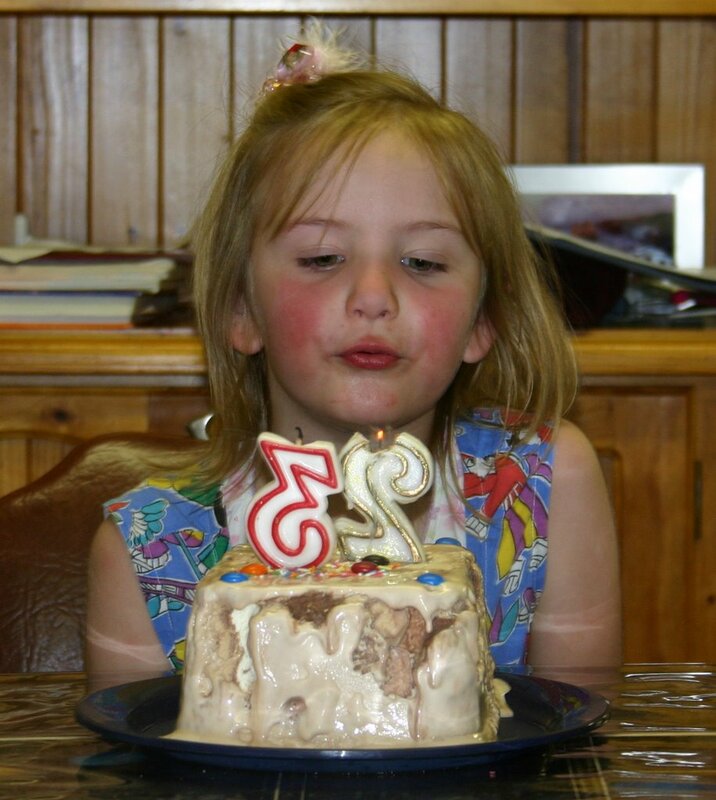 Blow out the candles before the cake melts!This week Clare was able to be the centre of attention. She awoke to find lollies under everyone's bowls and some presents at her spot for the day - Dad's chair. All were able to share in her favourite cereal and everyone sang Happy Birthday as she opened her presents. On a birthday, the song Happy Birthday is sung many times during the day. We noticed that Americans don't sing this song properly. After the song is over, someone is supposed to shout, "Hip! Hip!" and everyone replies "Hooray!". That's the correct way! We added the last bit at every birthday we attended in the US, and despite the odd looks, everyone knew what to do. Meals on a birthday are the decision of the Birthday boy or girl. When asked, Clare replied, "Ice Cream Cake!" So Clare didn't really care about dinner, she was just looking forward to her dessert. You can see the "cake" in the picture. We didn't have a number five, but Clare thought having two candles that add up to five is even better! My legs were cross eyed. This morning Clare sat at the breakfast table and blinked slowly, not quite awake. As her eyes focussed, she announced, "When I got up. My legs were cross-eyed. " After some quiet giggling from those nearby she added "And I kept crashing into the walls." Perhaps she should take more than a split second in bed before getting out next time. This is an impressive display of way too much spare time. 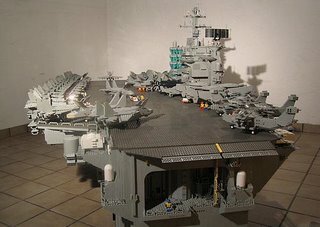 A Lego Aircraft Carrier built to the scale of those Lego Men. Click on the photo for more incredible photos. The bay underneath the platform was amazing! War Horse, War Cow. No difference to me! 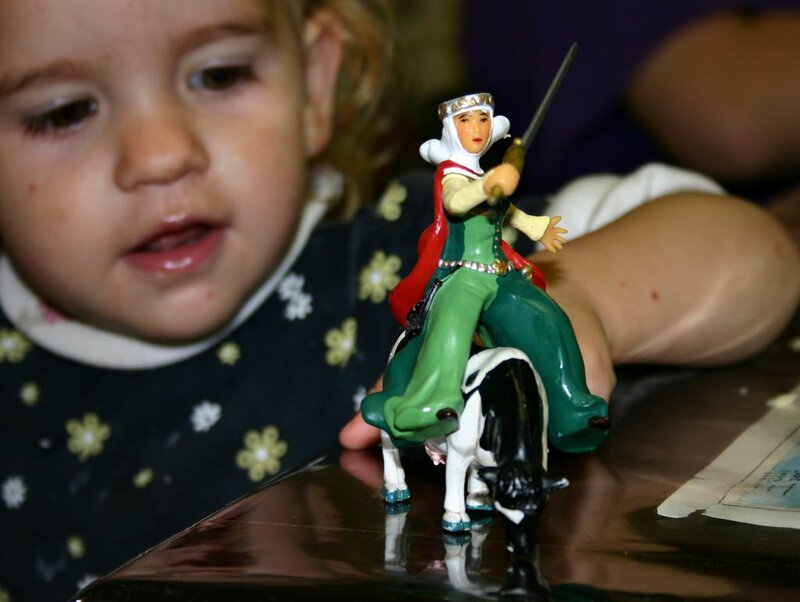 Giddy up!Rose is currently enjoying herself playing with a Papo Maid Marion mounted on a fine War Cow. Maid Marion shouts her war cry, "Mooove", striking her opponents udderly afraid, stuck on the horns of a dilemma, not knowing which way to turn. "I'm milking this for all this is worth, no bull"
Luckily for me, now they have started watching Shakespeare's plays, they know puns go back at least 400 years. 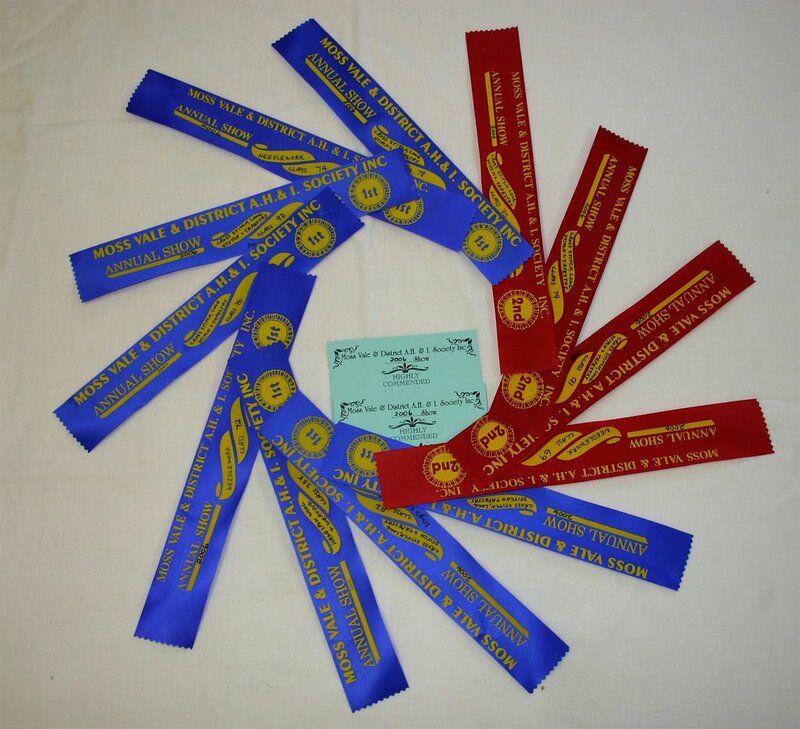 Here is a photo of the prizes awarded for our entries to the Moss Vale show. We didn't enter as much as we would have, in reaction to the show's policies and prices. Clare was the biggest prize winner with her Teddy Bear, Balloons and Butterfly Card, each being awarded First place. Peter's elusive Outlaw won First and Eric's Knight also won First place. Ariel's Baby Book was beaten by Eric's Knight and won second place. Her card also was awarded second place but her shawl was awarded first. There wasn't much childrens' entries in the show. 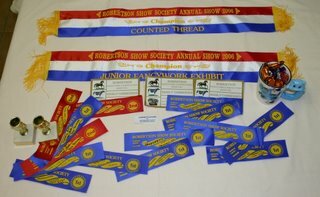 Normally the bulk of entries are from Homeschool children or the School based classes. These school based entries are where the teacher decides that the class will be creative so everyone makes a variation of the same thing. Lana's Poppies and Topiaries were both awarded First in their categories, Seconds for her Peacock Baby and Celtic Spring. The best part was when we went to pick up the items. The steward's eyes lit up as she realised we were the family with "so many entries". The intepid B Where's explorers have updates! B6 surfs the primitive web. We have been home about six months but occasionally our retrained reflexes get confused. Vehicles in Australia drive on the left side of the road. Road signs inform us to "Keep Left". Normally it isn't difficult to just stay on your side of the centre line, observe the direction or parked and moving cars and the facing of road signs and you're OK. But on country roads with no markings or traffic both Lana and I sometimes have a quick flurry of concern and make sure we are on the right side. I mean, the correct side. The left side. So, when driving here remember "Left is Right"
Recently, we bought a computer game called The Lord of the Rings, The Battle of Middle-Earth. All three boys put their money together to buy it. The Battle of Middle-Earth is an interesting and fun game where you can command the armies and heroes of Gondor, Rohan, Isengard or Mordor. Each different country has special kinds of troops and buildings. Some are stronger then others, some cheaper then others. There are two ways to play, either campaign and skirmish. In campaigns you replay the battle scenes from the three movies, you can control the good or the evil forces. In the good campaigns you start of as the Fellowship in Moria. In the evil campaigns you start at Isengard as Saruman. In skirmishes you choose to be one of the four countries of Middle-earth, choose your colour, location and enemies. The graphics are extremely well done. We are enjoying the time we are able to play. We wish we were allowed to play it more ;-). 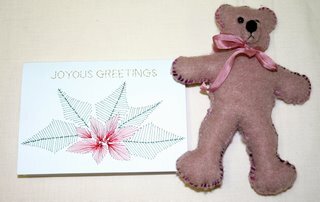 Yesterday, I finished stitching the Teddy Bear Bellpull I have been working on. We will post a picture once it is hanging on the wall. Now, comes the dilemma! What to do now? I have changed my mind a few times over the last two days. I have so many ready to stitch (about 15) that I could start straight away with out having to buy any more supplies. Ariel tried to help me to work out a system to narrow the decision down. I think we came up with the idea that if I stitch a smaller one now, I can have it done sooner. 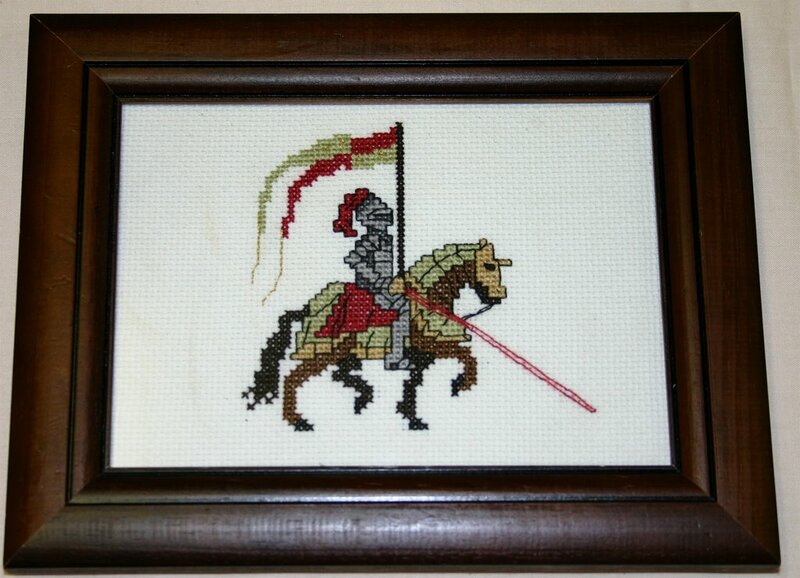 That way I could get more cross stitches done. I will try to finish the SAL I have been working on before starting The Gazebo. 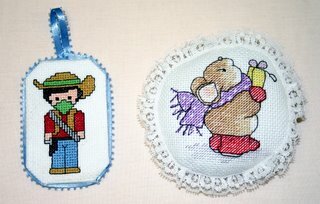 The Choices for the next one are Angel of Hope by L&L, Sunday Best, Fairy Moon #1 by Mirabilia, Stargazer #88 by Mirabilia, Angelica L&L, White Lightning, Angel of Dreams by L&L, Cinderella #69 by Mirabilia, Roundup by Couchman Creations, A Bedtime Prayer, Sweet Dreams L&L, Valley of the River Beck and Palamino by Ross Originals. Stargazer and Fairy Moon I will be stitching on a mediun blue colour fabric instead of the one in the pictures. If you would like to help me decide the next project, leave me a message in the comments. PHAT Mommy (Parenting Homeschooling And Thriving) is hosting this week's homeschool carnival with a ton of interesting links. 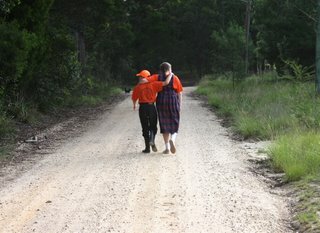 Our article on "What are Grandparents Good For?" is included. Kim from the blog "Life in a shoe" has started a Carnival of Kid's Comedy. This is week 2 and Clare gets a mention for her "I'm not a button" and "Giving up Lollies" quotes. Week 1 also had some good examples of children doing what they do best. 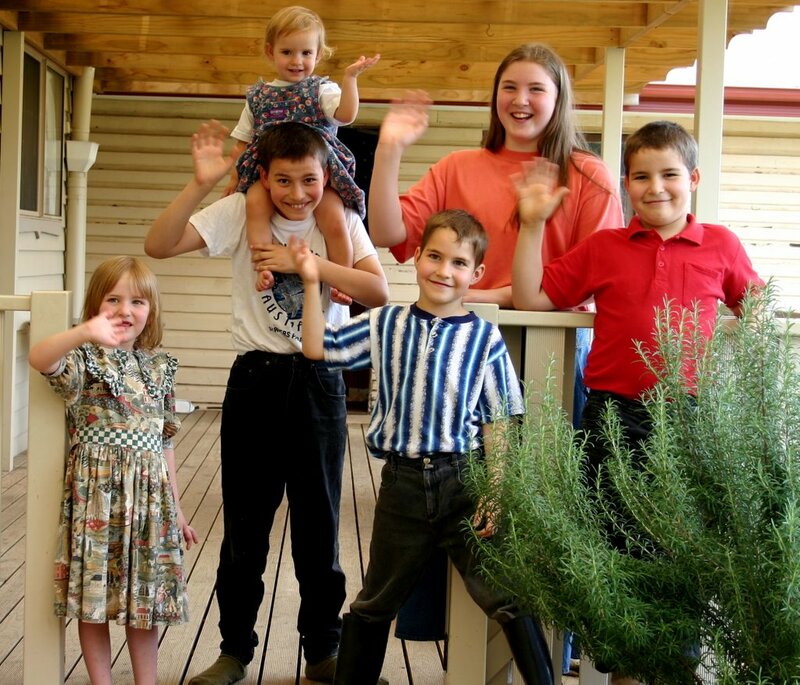 Kim is a second generation homeschooling mother of seven girls with baby number eight on the way. Of course, a family of seven girls means many interesting times, especially with a new baby on the way. This is one of her recent amusing tales of the children commenting on how well she looks - "Support all round me". Hey Dad! I can see much further from up here!Our neighbour across the road popped in today and offered us a very large pumpkin. They had a huge pumpkin vine that had started from stray seeds in their compost pile and the large pumpkin was the result. We cheerfully accepted and gave them some cucumbers which we had grown in our garden. In some of the grooves in the pumpkin skin we found these two very small snails. I convinced Clare to put them on her hand so I could take some photos. 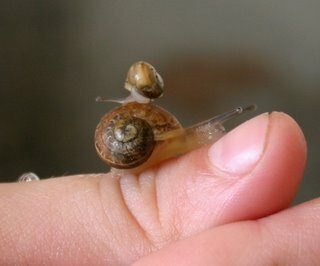 Despite her nervousness she was fascinated with the really little snail which climbed up on to the back of the slightly larger snail. You can see how small the snails are when you compare it to Clare's (4 years old) thumb. Not long after this photo she felt a little of the snail trail on her hand and shuddered the snails onto the table. Then both Rose and Clare peered at them closely, watching them slime away. Clare came up to me yesterday and stated clearly, "We shouldn't give up lollies for Lent Dad." "We have to prepare for Easter." "Yes. We shouldn't forgive up lollies." "We give up something and do something good too. What should we do?" "I give one Barbie I don't want to Ariel. And some clothes to go with it." "On your birthday [coming soon] we will have lollies as it is a very special occasion." Phew. Worked out what was in her mind behind her thoughts. We have a tradition for birthdays of placing lollies underneath bowls in the morning. When the children awake, with the birthday person sitting in DAD's chair, they get to enjoy the surprise of a selection of lollies under their plate. Now Clare knows that will still happen, she is OK.
After some diligent Google searching I found the problem is actually on Blogger's side and will be corrected in due course. The post still is in blogger, just not appearing on the blog. So just doing something else and trying again overcomes the problem. How long do you think it would take to pay of this at the minimum payment rate? 7 years and 9 months. Total repayments would be $1,850 on a $1,000 debt. Also, there are extra charges and once you start paying off a balance all new credit card purchases are charged interest from day one. Always pay off credit card balances by the due date. Keep you Credit Card receipts as you make each purchase and either record them in Quicken or Excel or somehow keep a total. Then you should not get a surprise when the statement arrives. This little Google Video applies what seems to be the Microsoft Packaging standard to the iPod packaging. The Headmistress at The Common Room was able to squeeze in the time to compile this week's Homeschooling Carnival, in between packing boxes ready for house moving. I have only been able to post a link to it now, but have a look and see what is news on the homeschooling and family front. Our article on Sibling Non Rivalry is included in this carnival. Just a little closer should make it easier ...This week we have had my parents visit our home. They live over 800km (500 miles) away and organise to visit us about twice a year. The children eagerly look forward to their visits. On the first day they arrived Peter was the first to notice them coming through the back gate and he rushed inside screaming, "They're here! They're here!" The first day is always the hardest with each of the children vying for attention, and trying to show six months worth of interesting things in the space of about 10 minutes. 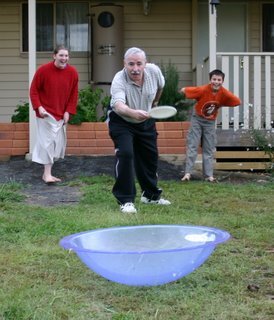 Today was my parents last day before heading home and the children had arranged with Grandpa to have a frisbee competition. 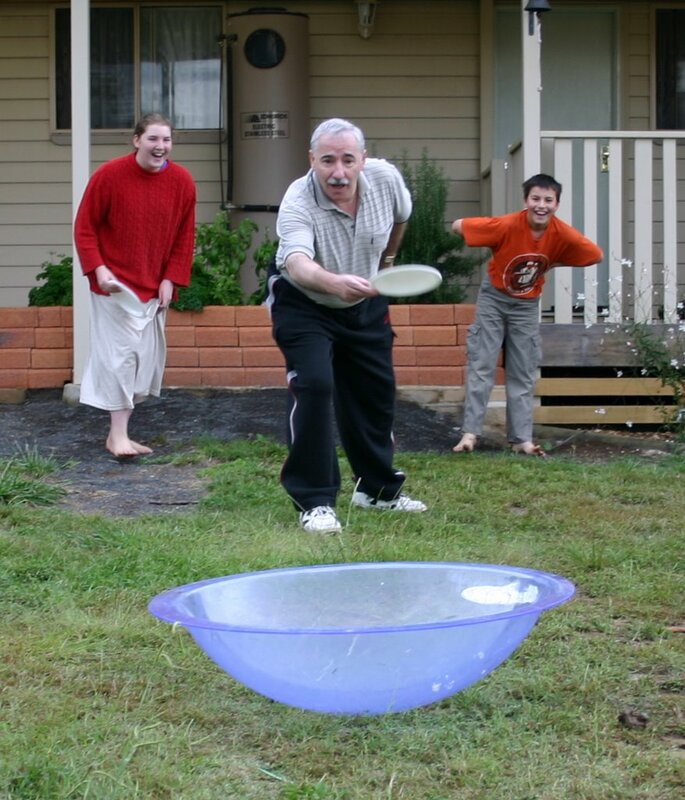 We didn't actually have frisbees, so plastic plates were to be used and the target was one of those ever versatile playground bubbles. In this photo Dad is trying to gain a little advantage by getting closer to the target before throwing. It didn't work. Grandparents are a very important part of the children's lives. It provides a link to the past and the present, helping each child determine that he is part of a chain stretching generations back to Adam and Eve. Peter mentioned to me tonight that Grandpa's dad is pretty lucky. "Because he is over 90 years old." Peter, like many children, can see what many of us forget. Life is a gift to be enjoyed and treasured. Every extra day of life is a reason for joy. A few months ago I linked to a little video showing how you can quickly fold a shirt. One of our readers has told me of this even better way - make your own shirt folding machine from cardboard and tape. Thanks for the tip Bretta! 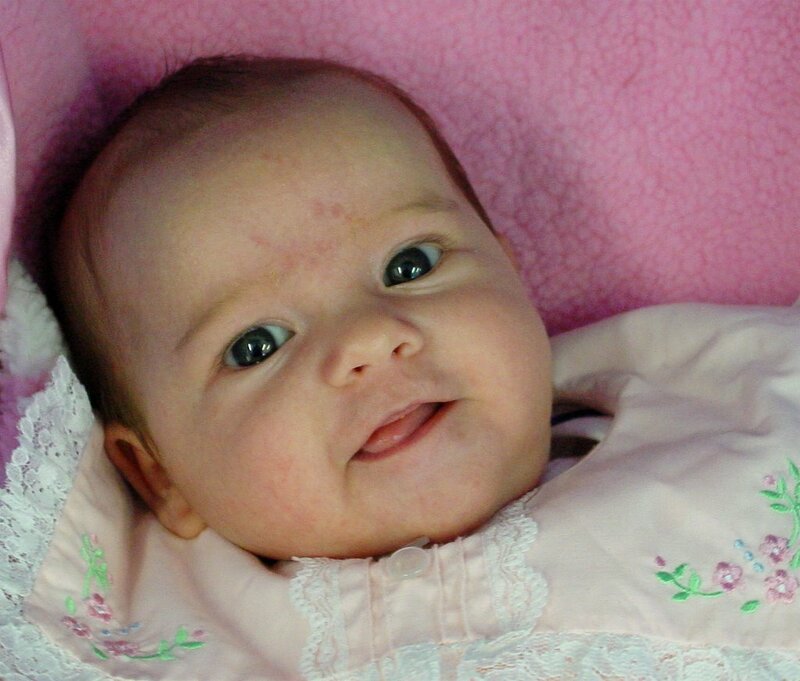 "Is that my lovely Clare, awake and alert and cute as a button?" Updated: I used "similes" rather than "Metaphors" resulting in an impromptu grammar lesson with Lana and the children. For those of you that have enjoyed The Princess Bride and either quote (or know people that quote) extensively from the film, check out this very clever bit of work. It is The Lord of the Rings trilogy artisticly expressed using (slightly amended) quotes from The Princess Bride. Scones. 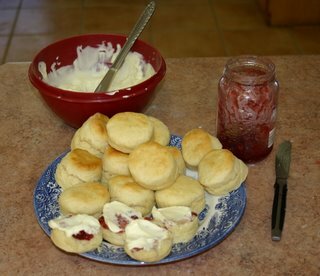 Perfect for morning tea.This is the recipe for the Robertson Show award winning scones. They are sweeter than "biscuits" in the US and are traditionally served with jam and cream. Plonk the lot in a bowl, dry ingredients followed by wet. Roll out about an inch (2.5cm) thick and using circular cutter or small cup place individual scones on prepared tray. Bake at 200C (390F) until light brown on top. 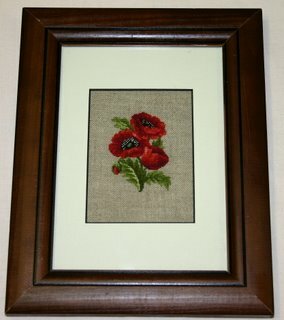 This pattern is from EMS Country Nosegays and Lana has stitched it one over one on 32 count linen. This means there are 32 threads to the inch, which means there are 32 crosses per inch. Teeny tiny crosses. The actual design size is only about 4cm x 6 cm (1.75in x 2.5in). This has been framed by Lana using a standard 5" x 7" picture frame. This is Eric's Knight on Horseback. If the boys are going to cross stitch, they mean to do ones men would do! He entered this in the Robertson Show and won First prize in his Junior section. Lana and the children put in many entries into the Pavilion of the Robertson Show. As in past shows at Berry and Bowral all entries did very well. The Pavilion part of the show is to give locals a chance to display their skills in areas as diverse as needlework, cooking, flowers, photography, artwork, doll making, weaving, gardening and almost anything one can do with one's hands! As you can see by the photo we received many prizes. All except me! I only entered some photos. Digital photography has resulted in a growth of interest in photography and there was a large number of entries and strong competition. Lana received First and Champion Counted Thread for her Celtic Spring and also Highly Commended for her EMS Poppies. She was awarded First for the Ross Horse Head and her Rose was awarded Second (Both won prizes at the Berry show too). There was a full size version of the Horse and it was very large. 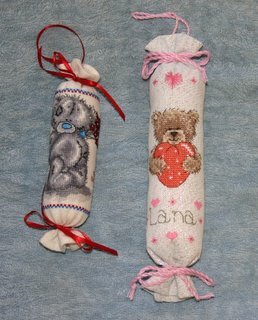 As Lana did hers one over one, the normal two over two version was four times the size. 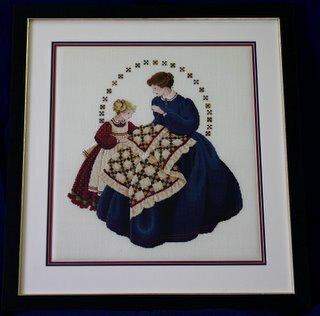 The Baby Animal Quilt was awarded First in Cross stitch on Aida material. Peter's Elusive Outlaw and Ariel's Tom MouseAriel also won First for her Christmas card (pictured here). When we picked up our entries we were told that the Judge was tossing up whether to award the champion award for Ariel's card or another entry. 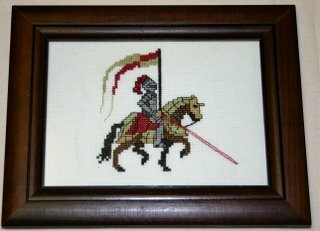 Eric won First for his Knight in the 12 and under cross stitch, and First for his scones which came with a little trophy. His photo of Rose with a grape stuck on her nose was given a Highly Commended award. James was awarded Second for his scones (against Eric) and First in Junior Photography - Family member for Peek a boo. His photo was also awarded an encouragement award of $10! Ariel's Christmas Card and Clare's BearPeter won First for a plate of Anzac Biscuits and a small trophy and for that most elusive outlaw he received a Highly Commended certificate. Last but not least Clare won Second for her bear and Rose was given a little sticker saying "Congratulations for entering good work in the show". When Lana picked up all of our entries, one of the stewards asked her if she was "the lady with all those talented children?". Once Lana determined that it was indeed her, all she could do was reply with a blush and smile. Once more the B family has been seen on the loose at B Where's. 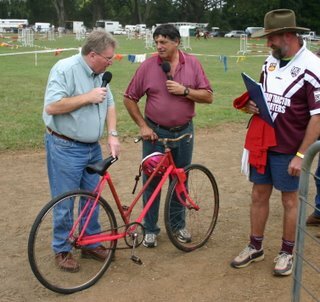 Bruce and Bruce discussing this fine bikeThe Robertson Show is a great Australian country show. There is the traditional competitions for horses, cows, chickens, pigs, dogs, alpacas, and other livestock and farm animals and sideshows. The pavilion has displays of many, many arts and crafts (which we enjoy entering) and it is a good reason for all of the locals and anyone from remotely nearby to enjoy themselves. James and Peter being caught on the inside laneThe part we participated in yesterday (seeing as we were there all day!) were the races. The boys all rode in their races and realised they weren't as fast as they wished. More practice will improve their chances next year. 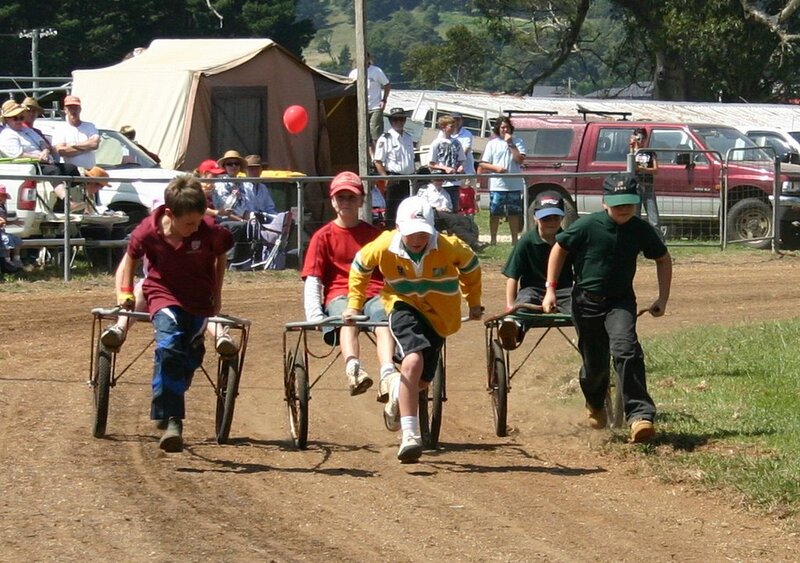 Then there were gig races. 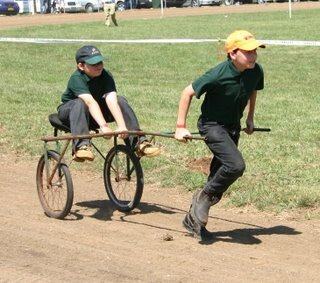 This is where gigs created for shetland pony trotting races are used by the children with one pulling and another in the jockey's seat. They wanted to have children from the same school so we entered Peter and James together. Bruce asked each of the teams their school and then called the race using the school names. So we heard on the speakers, "Roberston is in the lead and Burrawang has cut off the Homeschoolers, but the Homeschoolers are pulling hard!" We didn't qualify for the finals but they had fun. Later in the day in the gig finals, one of the finalists wasn't there so the organiser came over to us and asked, "Do your boys want to go in?" Eric and Peter said, "Sure!" and they raced in the finals anyway, ending up equal third. The organisers have rules, but they aren't very rigid rules. If they could get more children in the race they would. If it didn't look fair they would apply handicaps, if that wouldn't work, they actively assisted the underdogs. 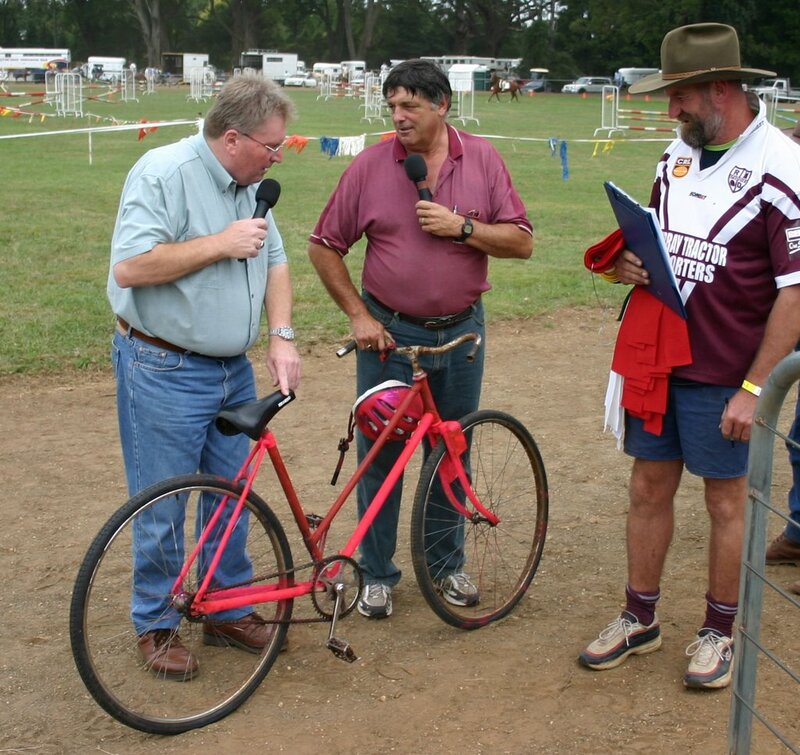 Next year I'll be biggerAt 3:00pm there were the Australian Championships of the Spud Race. It is an Australian championship the same way that the US World Series has international entries. The warm up races were the junior and ladies competitions where the participants had to carry a 12.5kg (27.5 lbs) sack around the track of 400m (450 yds). Eric had been practicing for the last four weeks, but as the age group was 12 to 15, he was one of the smallest. He made it to end and will be bigger next year, but he was very tired. 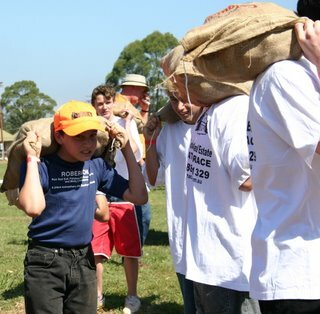 The Australian Championships had the fellows carrying 50kg (110lb) sacks of potatoes around the same track. There were a few spills from over balancing and one fellow decided he wanted a ride by the vehicle that follows the last runner. As first prize was $1,000 ($750 US) and locals get a bonus $300 for the first local to cross the line they had many entrants. The man who won was a local so he earned $1,300 ($975 US). "That'll get you a few beers, mate" announced Bruce and Paddy. The Wheelbarrow races were next and Eric was talked into pushing Peter. They finished third and have ribbons as prizes. As the organisers didn't have the correct ribbons for the novelty races Bruce announced, "We've run out of blue ribbons, so pick any ribbons you like. everyone gets a ribbon at the Robinson show!" 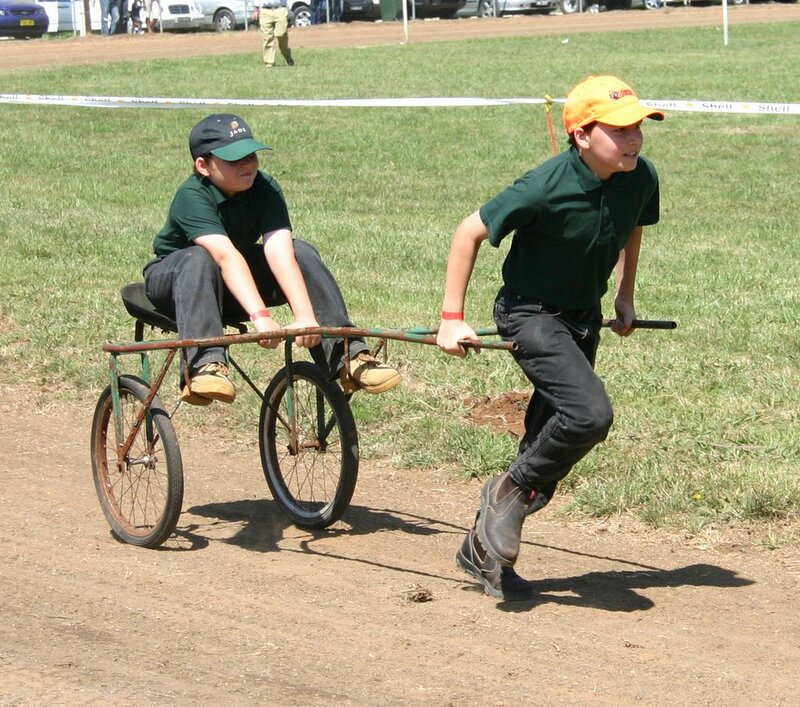 By the time we finished the day, Eric had ridden in the bicycle race, pulled the gig in two races, pushed the wheelbarrow in two races, carried the potatoes around the track and ran with me looking for Peter at the end. Needless to say, he did not make much noise after getting into bed! It is interesting how we always make plans but often these plans do not come to fruition. We have mentioned this before in "The Perfect Home" but this weekend is a case in point. Plan A: Sleep in on Saturday, have lunch and go to the Robertson show in the afternoon. Reality: The boys noticed there were bicycle races they could enter starting at 11:00am, and you had to register at 10:00am. This meant leaving home by about 8:30am. We were woken at 7:30am anyway by Rose hopping in bed. OK. Off we went. Plan B: We'll get some bread at the hot bread shop and bring all the bits so we can have lunch and dinner without paying show prices. Reality: We did get the fresh bread rolls, and we did pack all the bits to go with it in cooler bags. We even stopped at lunch time and went to the car and had some rolls with ham and cheese. But dinner never happened other than some dry rolls as too much was happening! The children were too busy to think about food - other than chips and crackers and drinks we had brought with us. Plan C: We wanted to leave early before the fireworks in order to miss the car park mess that always happens when everyone wants to leave at the same time. Reality: Half way back to the car, we had to turn around for a toilet break. Then we couldn't see Peter, so Eric and I went back to the car to see if he continued on. He had actually made the first U turn and was already at the toilet block. Re-united we finally got to the car as the fireworks ended, but we did miss the worst of the car park chaos. Plan D: We were to pick up all of our show entries and prizes early and put them in the car. Plan E: We would sleep in and go to 11:00 am Mass and have a lazy day at home. Reality: The show was open today from 9:00 am to midday so we had to get up and attend 9:00am Mass, the drive to the showgrounds to see if the cross stitch was either where we were sitting, in the Pavilion or in the car park. Someone had found it the night before moments after Lana and Ariel had left with all our entries and handed it in to the Show attendants. It was waiting for us safe and sound in the Pavilion. As a great person once said "If you want to make God laugh, tell him your plans." I figure that if God can make Good things happen out of evil, surely we have little option but to make the best with whatever reality throws at us. After all, most time and events are only parially in our control. Accidents and "acts of God" happen and it is up to us to handle the changed situation as best we can. - Lana got a new lounge. And we kept smiling and enjoying the life God has given us! Brother and Sister in arms.Like most parents we are always evaluating whether we do the right things by our children. 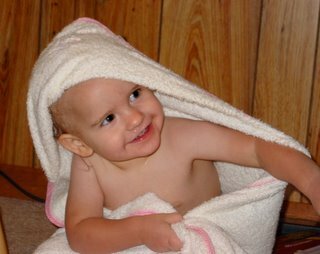 Luckily, as homeschoolers, we get to know all the children pretty well as we are together most of the time. We have avoided the morning "off to school" chaos, the quiet day with just the littlest children, the "home from school" grumps, the homework challenge and the multiple extra curricular activities. Instead, we arise at roughly the same time (although I often have to leave at the crack of dawn to visit clients), have breakfast, the children do their schoolwork with Lana, Lunch is around 1.00pm to 2.00pm or so, some extra reading or school stuff for the older children and play time until we have dinner together as a family. All this time together has meant the children get to know us and each other and we are able to understand them. Fights and disagreements, when they occur, get resolved quickly and life moves on. There is really no choice. Sibling Rivalry is a term we often hear of, but have not really experienced. The photo above was taken on a recent walk. This wasn't a set shot. We enjoy family outings - even shopping trips! Our travelling in the US with eight of us crammed in a Suburban for trips over 3,000 miles were fun (see the side links for trip reports). We listened to audio books together, shared experiences, met great people, experienced car break downs and generally "bonded". Bonding is a direct result of Love (Spelled T-I-M-E). That time spent together is not a tactic for familial harmony. It is a way of life where the ones who give themselves receive love in return. No greater love has a man that gives his own life for another. To the greater child-free world, parenthood and family life makes little sense. But the rewards are here and now. Time with our family has been our best return on investment. It's broken! I don't know why. Fix it.Rose was quiet. Too quiet! She then began complaining. Upon investigation she had pulled out all the wet ones (moist towelettes) one by one until the pack was empty. Then she was upset because her new toy was "broken". 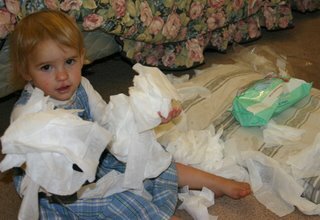 We retrieved all the towelettes and put them in a zip lock bag but Rose's face when she was discovered shows you why children are born cute. It's their prime means of survival! 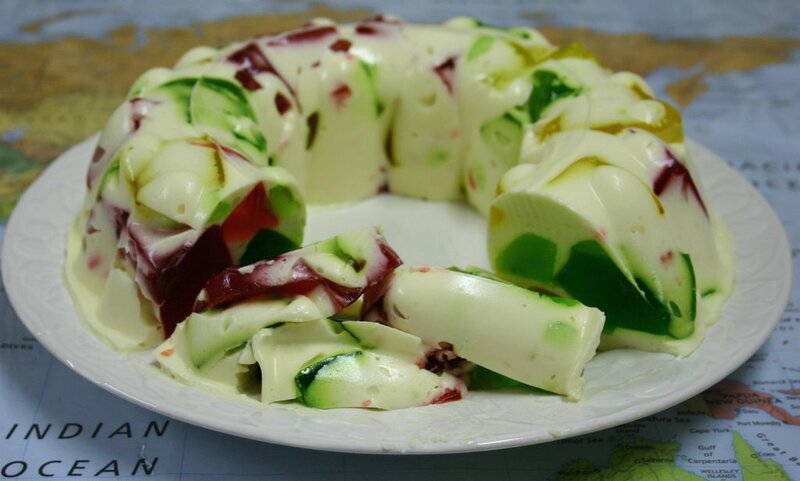 This dessert is always a success with children and adults. We are well known for bringing this when we visit family and friends' gatherings. It is called "Broken Glass" as each slice looks like a section of stained glass. We get some very odd looks when we ask, "Have you tried Broken Glass?" Set each Jelly separately with only one cup of water each (i.e. Double strength) and allow to set overnight. Dissolve gelatine in hot pineapple juice. The colder the mixture gets the faster you need to fold in the ingredients. Beat cream, sugar and vanilla essence. Cut jellies into medium sized cubes/chunks, and fold into cream mixture. Pour into Jelly mould and set. Serve either on its own or with cream or ice cream. Cut into slices to get nicest stained glass effect. PalmTree Pundit is hosting the 10th Homeschooling Carnival centred around the theme of Spring. Although Autumn is beginning here, the weather is currently pretty similar. Our post on "What Brothers are For" is included in the carnival. Fine Art by a child under two. We have had a number of requests to actually see what Rose was stitching so intently last time. 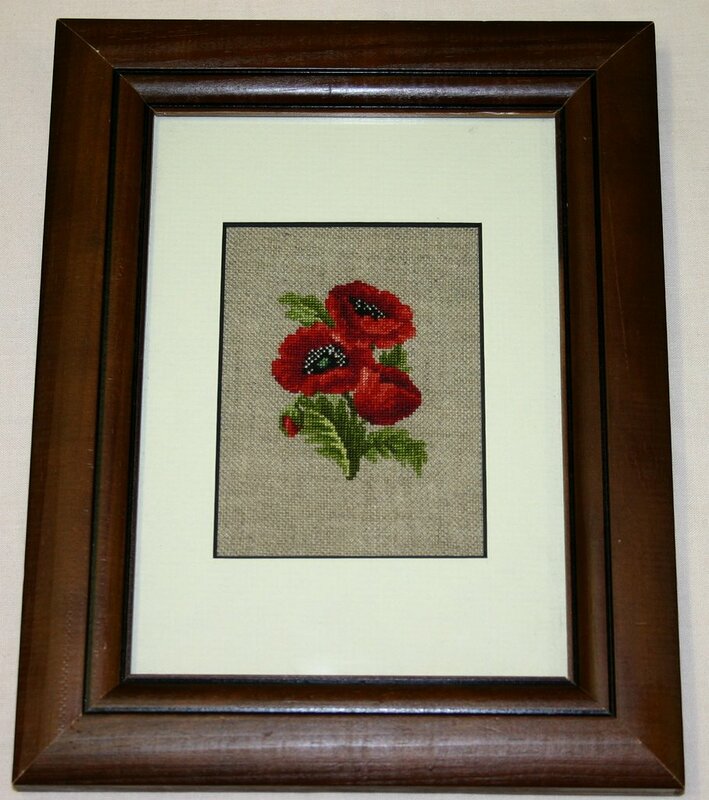 Rose has continued to do her "cross stitching" and wanted to show off her work, so here it is. Maybe we can enter it into a show under "Abstract Art"? 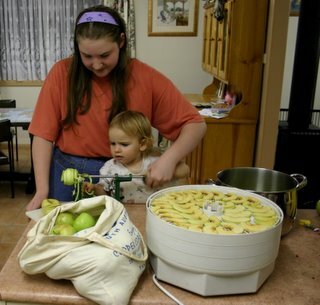 Rose concentrating on getting the apple peel.Yesterday Lana's Mum and Dad delivered a bag full of apples they had collected from a local apple tree. The birds hadn't yet cleared it of apples. Beauty! Apple time. Using a very handy combination apple peeler, corer and cutter we picked up from Walmart quite cheaply, Ariel - with Rose's assistance - began the process. 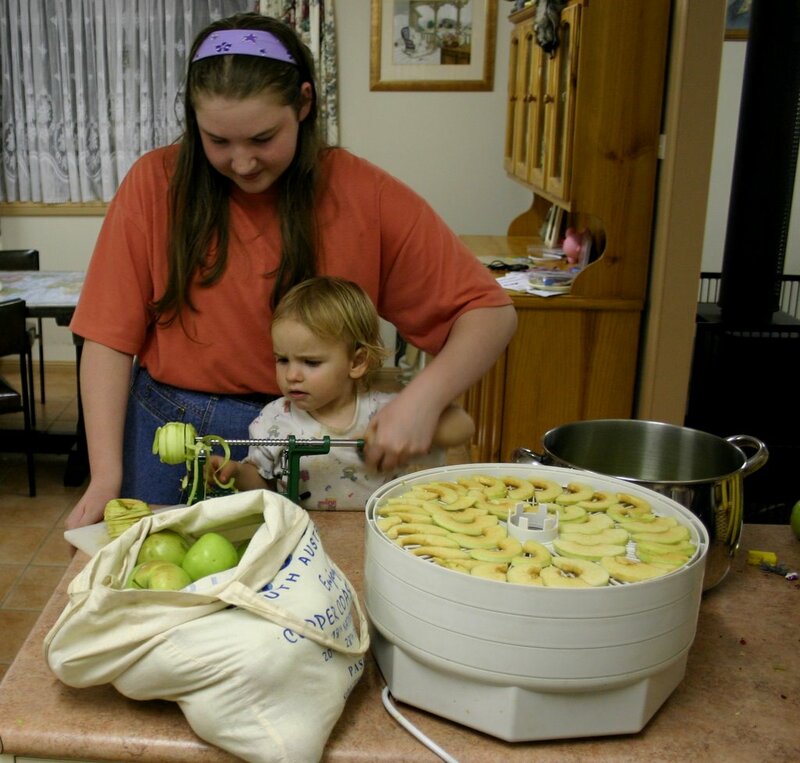 I then cut the apple spirals in half creating semi circles and Clare placed them on the rack of the food dehydrator. The peels and cores were placed in the pot by Rose for boiling into Apple Jelly. This morning, the boys put most of the dried apples into a container, after eating a portion. The house now smells of cooking apples with the aroma of apple sauce and boiling apple jelly spreading through the house. Mmmm. Much too nice to poke needles in.The reciprocal needle rolls in the exchange program arrived today. 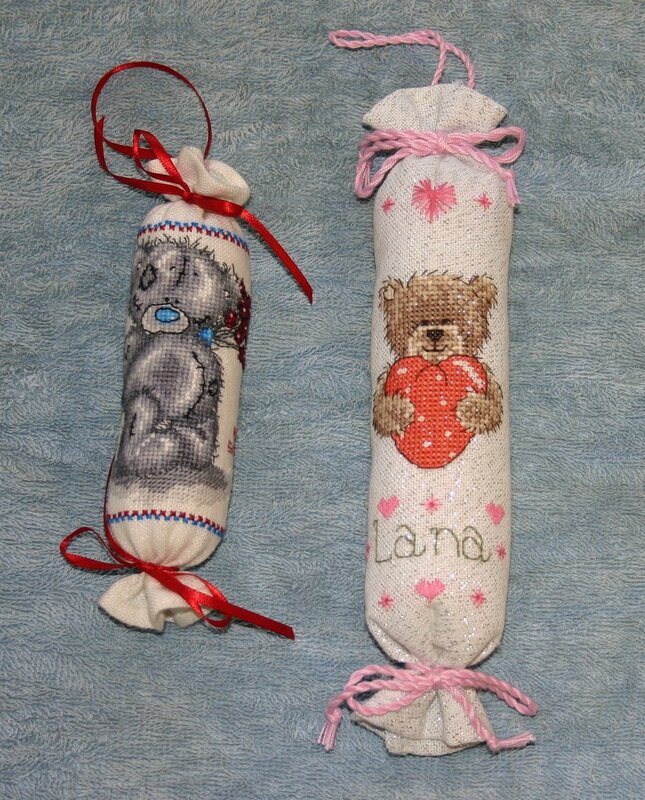 Lana's one from a lady in Germany (on the right with the word "Lana" on it) uses the same design as the one Lana's mum used. However, comparing the two you can see how much one can change a standard design. The fabric is a special one which sparkles in the light and the array of hearts around the bear are pretty. 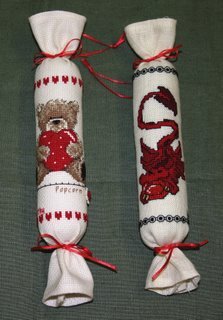 Mum's needle roll came from a lady in the UK and is based on a Tatty Teddy pattern with a lovely custom border. It was exciting creating and sending our designs to ladies overseas, but today school work was halted as all gathered around to examine the new arrivals. Lots of "oohs" and "aahs". 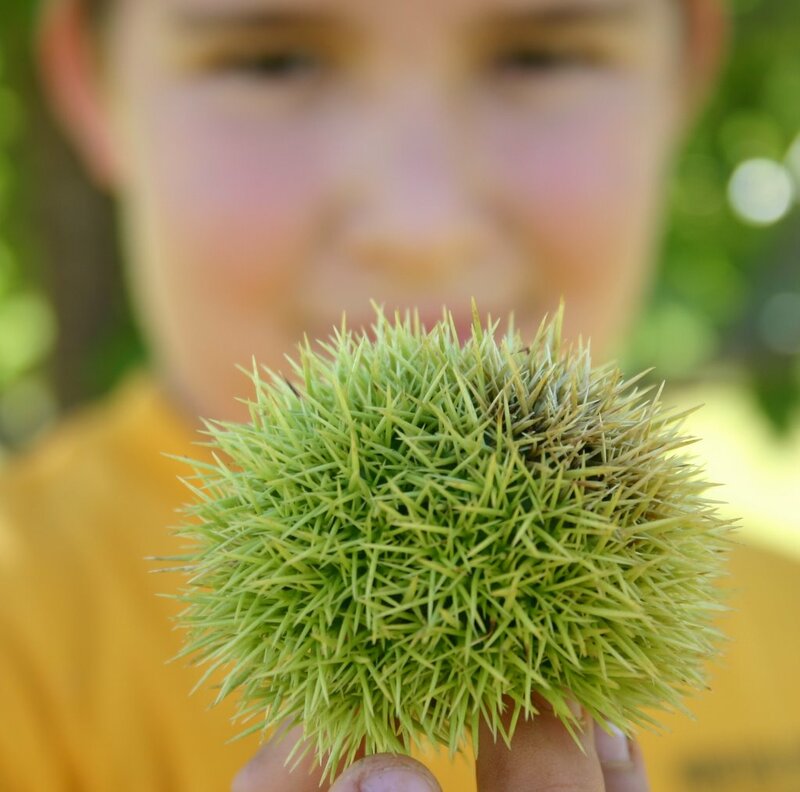 Too spiky to grab.James has found a number of these spiky seed pods since the heavy rains. They have been washed along so we haven't been able to find the source tree. Some internet research has found that this is the sdeed pod of the castanea sativa (sweet chestnut) tree. This page shows what the tree looks like so now James can go exploring. The spikes are VERY sharp which is why James' fingers are holding the ball so carefully. Now that's going in the Treasure Table. Countries around the world have set 25th of March as the day on which the Unborn Child is remembered. The baby growing in the womb should be in one of the safest places in the world but unfortunately this is not the case for many children. Every year there are processions organised to remember all unborn children. In Sydney this year the procession will be led by Bishop Julain Porteous. 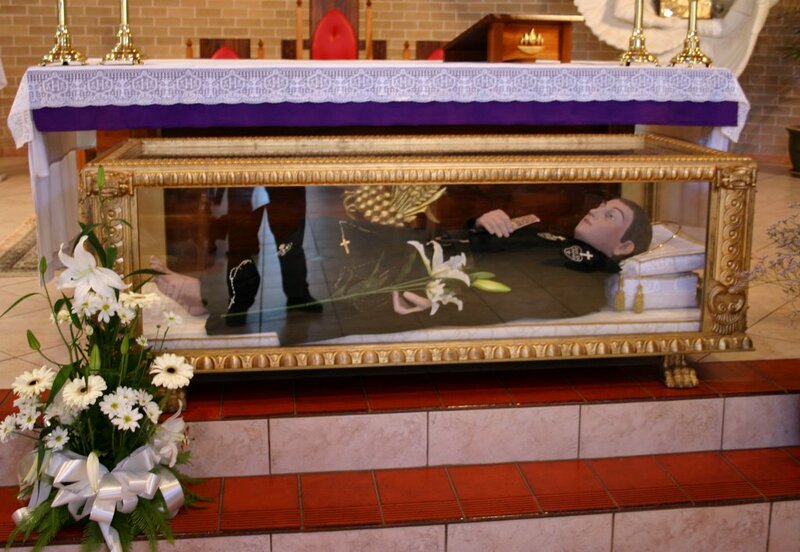 The day commences at 10.00 a.m at St Mary's Cathedral, Sydney, with Benediction followed by a procession through the streets and back to St. Mary's for Mass at 12.10 p.m.
Today we attended 9:00am Mass at the local Monastery and we were surprised to see this glass coffin in front of the altar. It is a statue of St Gabriel Possenti and was in place for the special Mass being held at 10:00am for an Italian community from Sydney. The monastery expected about 1,000 people to attend. There is a movement to make this saint the patron of hand guns, primarily from this incident which caused the village of Isola in Italy to call him "The Saviour of Isola". Possenti, with his seminary rector's permission, walked into the center of town, unarmed, to face the terrorists. One of the soldiers was dragging off a young woman ... when he saw Possenti and made a snickering remark about such a young monk being all alone. That's today's history lesson. 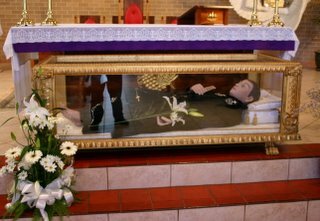 Further information about him can be found at EWTN. Update: It appears as though the story with the gun may not be true. Even without this story St Gabriel still makes fascinating reading. Thanks to Mr Anonymous for the tip. Hey you! Who you talking to?We showed you the first three stages of the life of a banksia flower previously, today we can show you the last stage. 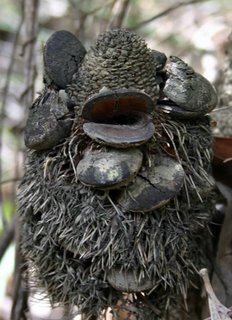 The furry bits start to fall off, it loses all of the pretty colours and the seed pods open up releasing their seeds to propogate new banksia trees. 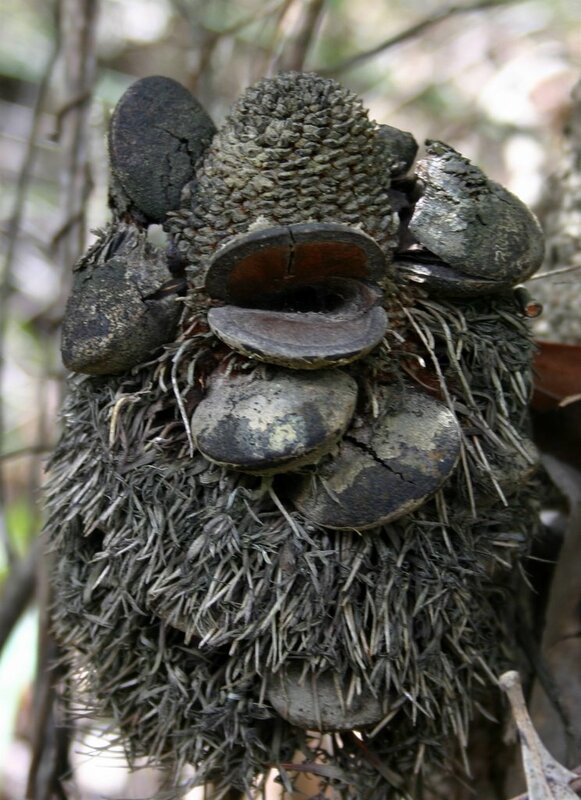 The open pods look like mouths which is why May Gibbs visualised them as Big Bad Banksia Men. 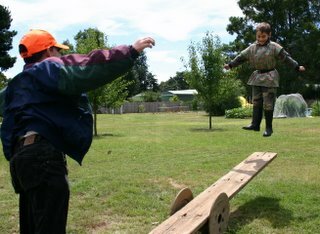 Up, up and away!Today the boys set up their own see-saw using an old wooden spindle remaining from the electrical wiring when the house was built and an old plank of wood. With Peter at one end, Eric jumped on the other, letting Peter fly! How much fun it is having siblings as playmates! This is a white tailed spider we found in the boy's bedroom this morning. The media has hyped up the white tailed spider as being very dangerous to people causing massive pain and maybe even death. - to control them inside, just clear away all the spider webs around the house, which is their food source. The last point is too late for this fellow as he has now joined his ancestors, but in future we'll capture any white tailed spiders and throw them on the garage to eat the red backs. (*) Red Back spiders are not at all nice, but since anti-venom was discovered no one has died from a red back bite. Update: We just caught a small white tailed spider in the barracks. This time Peter called me and I came with cup and stiff cardboard and caught the spider. We threw him towards the garage wall which had many spider webs. Unintentionally, the small spider was caught on a web and a larger spider came out to investigate the intruder. The larger spider and the smaller white tail danced around, each trying to gain an advantage, with their front legs ahead of them, like two sumo wrestlers feeling their opponent's defences. They rushed into a huddle and both spiders went still. We peered closer and couldn't tell which had won. Then we noticed the white tail spider's legs going red and knew he had won. Sure enough a couple of minutes later the victorious little spider moved on dragging his victim behind him. So the museum site linked above was right. 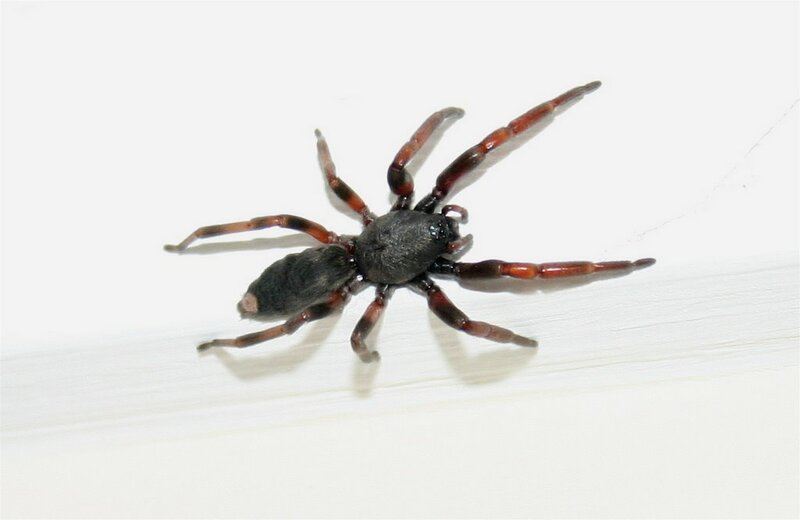 White tailed spiders really are spider killers! 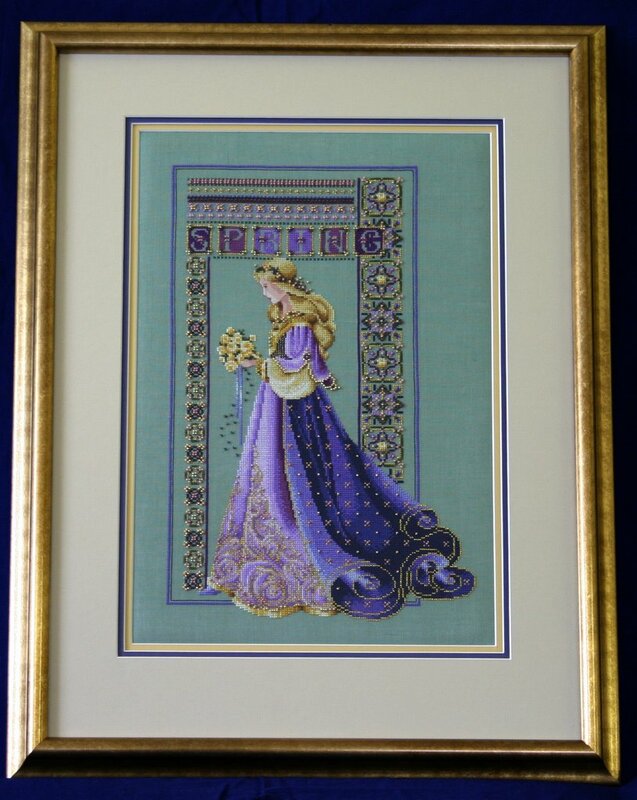 This is another Lavender and Lace design, "The Quiltmaker". Lana took quite a while to finish but the result was well worth it. 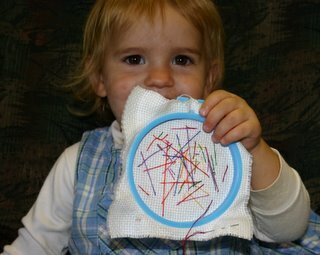 Combining the crafts of cross stitch and quiltmaking with a young daughter at her side, the picture was very appropriate. The reason Lana is so happy with all these recently framed pictures is that we haven't had any framing done in about eight years. The joy of seeing so many finished works finally on display is contagious for the whole family. 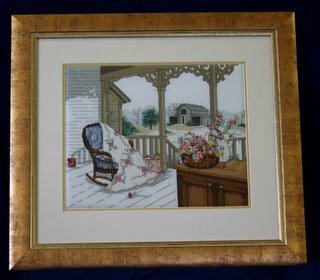 The house becomes more like an art show as each picture is displayed. Stitch by stitch Lana is transforming the house with works of beauty. To try something different, Lana put her hand to some blackwork. I queried the name as it was not just black, but also gold thread. I was just shooed away as being too literal to understand. 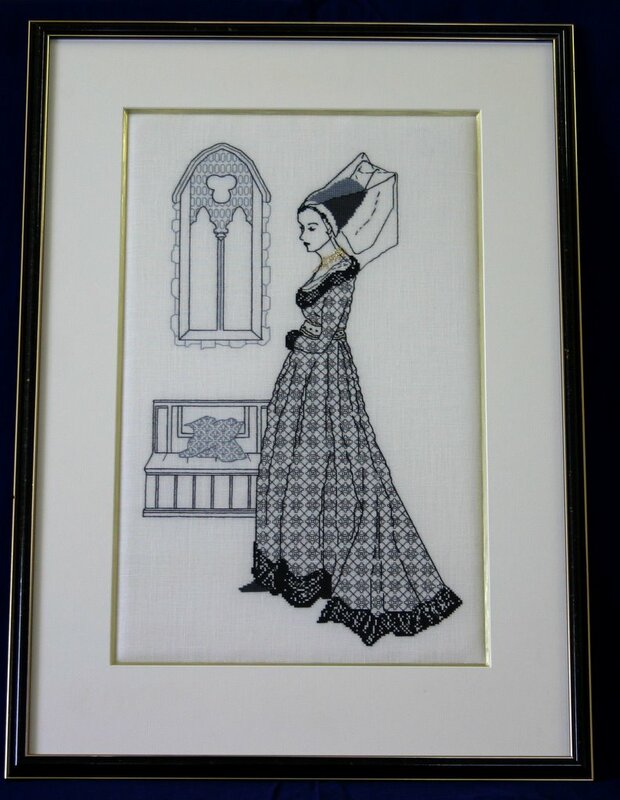 Blackwork apparently describes the style or technique and not the colour. Silly me. It was traditionally done in black but now is done in whatever colour the stitcher prefers. Click for a closer look and you will see the interesting detail of which blackwork is stitched. Rather than crosses of varying colours, there are a variety of stitches, mostly backstitch, giving shades and detail. The number of threads defines thicker or thinner lines. 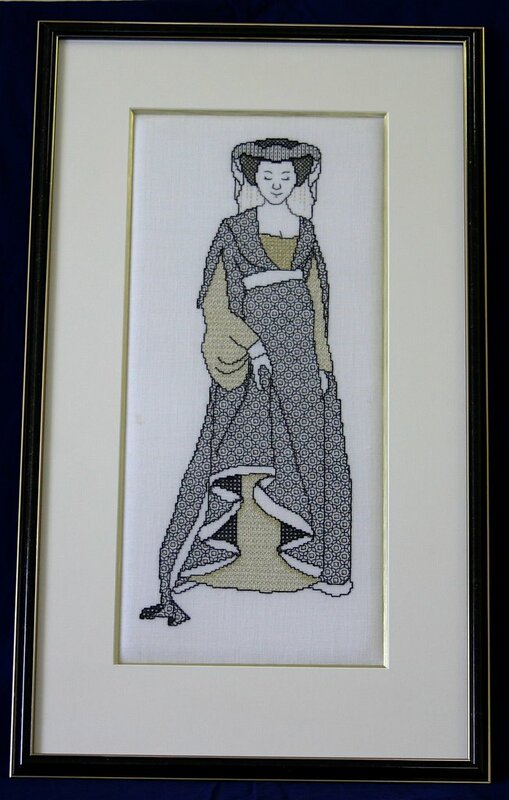 The edges use two strands, whilst the patterns are mostly in one, with cross stitch along the bottom of the dress and hat thingy. Now these are framed too, so more happy dances! 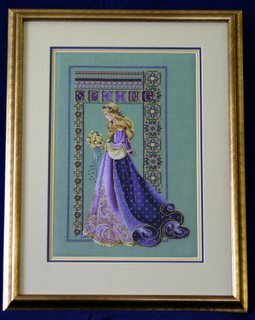 The Lavender & Lace's Celtic Spring, which we have shown before, is now framed! Lana is doing a happy dance. Now. Where to put it? This tapestry of The Immaculate Heart of Mary is a matching tapestry to the Sacred Heart of Jesus. We have mentioned this picture previously. Lana finished this about five years ago. The Sacred Heart picture had been completed some time before but up close there is little contrast so Lana quickly got bored. The face was completed in about a week, but the background was very challenging. Once more, perseverance paid off and we have some more beautiful art to enliven our home. 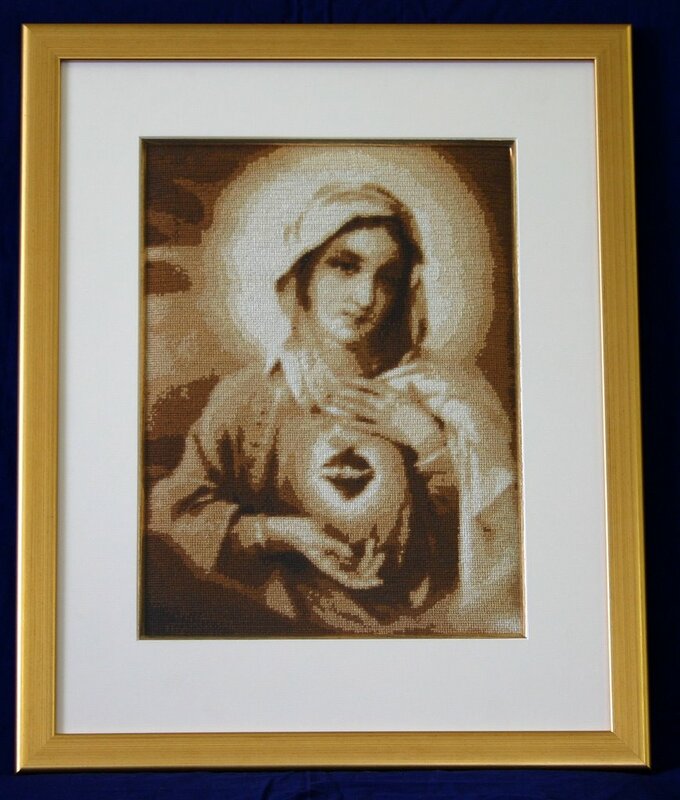 That Rotten Thing doesn't look too bad after all.Lana has finally had a number of her cross stitch works framed. We will be displaying them over the next few posts. 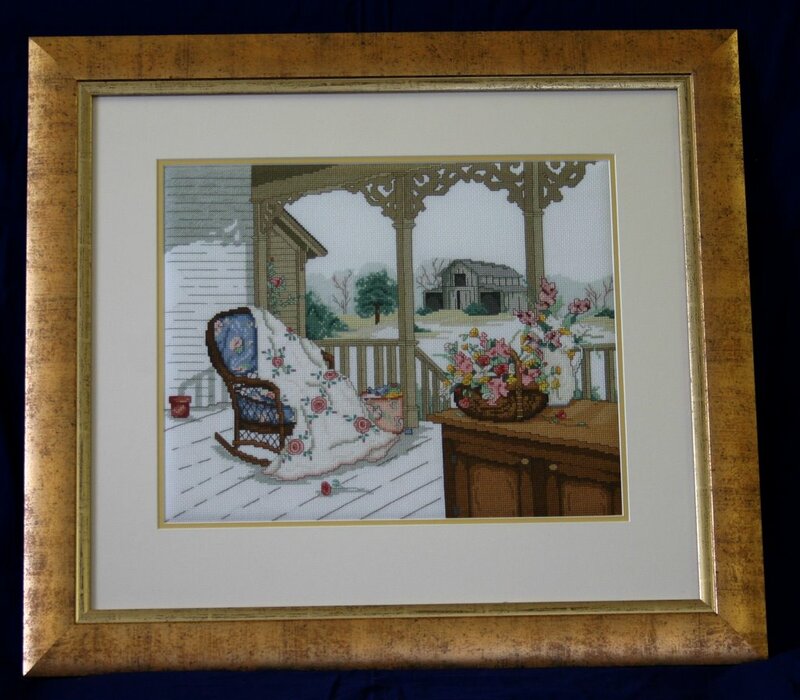 This is a Paula Vaughn design called "Rose of Sharon". As it was a colour chart, Lana dubbed it "That Rotten Thing" and it took ten years to complete. The completion time was not because it was extra large or complex. Lana just really dislikes colour graphs so kept putting it off. Each time she found the pattern when we moved she mumbled, that rotten thing and shoved it back in her stash. Then one day she decided it would not beat her and stubbornly finished the rotten thing. It turned out OK after all. The reason Lana disliked the pattern was she likes to make a working copy and then mark off the progress using a highlighter. Colour graphs do not photocopy well so the exact colour thread is at times difficult to ascertain. We have now overcome this hurdle. We cut the pattern into A4/letter size pages and laminate each page, then mark off our progress using a red overhead projector pen. Whiteboard markers rub off too easily and permanent markers are too permanent. I am a High Elf bowman of Rivendell from Lord of the Rings. The only time you see the High Elves is in the Last Alliance of Second Age that attacked Mordor. The Last Alliance was of men and elves. They are very great shots. The High Elves are a better close combat that Lothlorien Elves. The Second Age orcs weren't as clever as Third Age ones. First I had army overalls on and then I put on a yellow robe from the nativity play. And then chainmail (Ariel's vest) and then cardboard armour and a cardboard helmet. I made the armour with cardboard and duct tape. When Grandma and I were going around the big block I found a stick and it had notches on it. I was snapping the notches off and I hurt my thumb. I asked Opa for some string and he went into his van and he gave me green string and I tied it onto the stick. And that's my bow! We were given this recipe by some of our American friends. 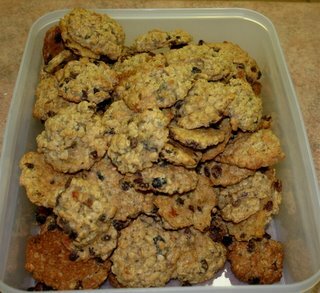 It is one recipe we don't have to multiply as it makes a HUGE load of biscuits/cookies. Apparently trying to reduce the recipe doesn't work. This picture shows about half the total! But they will last long enough for a few days of hungry children. You will need a LARGE bowl for mixing. 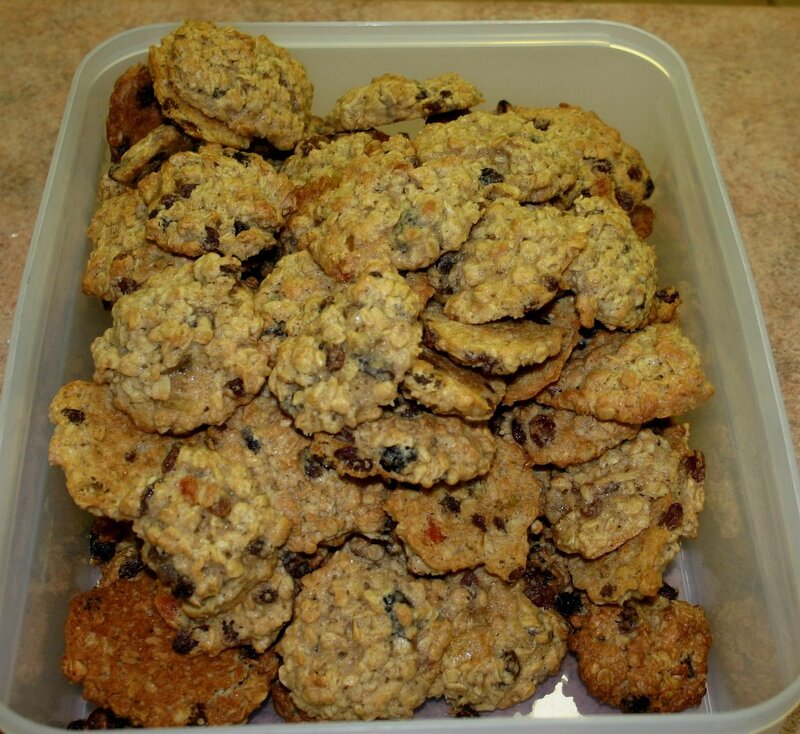 Use sultanas/golden raisins, choc chips, dried fruit, whatever. Probably NOT a Weight Watchers recipe. Lana and her Mum are participating in a Secret Needle Roll Exchange. This is organised by the Linabear Bulletin Board and each particpant is given another participant's name, with their preferences, and then an appropriate needle roll is created. The needle roll is a little cross stitch which is then rolled and filled with stuffing. Athough they are supposed to be used to store embriodery and tapestry needles, like a pin cushion, they are too nice and just go on display! The most difficult part was researching the options to create an appropriate design. Mum made the Popcorn Bear for a lady in America who likes English designs. Mum modified the standard design from an English Cross stitch magazine to make the heart more red. The hearts border was from the stitch-along Lana has been doing. The lady received it on Monday and posted in on her blog. Lana made the Birth stone dragon for a lady in Finland. 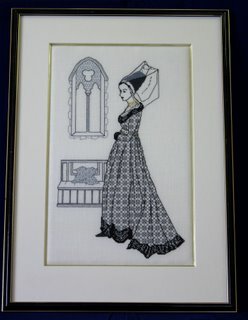 It is based on a free pattern from Dragon Dreams a few years ago with a black work trim along the top and bottom. The lady received it yesterday and posted it on her blog too. We couldn't post our picture until we knew they had both received the needle rolls because they are meant to be a surprise.